FINRA also took action against one firm for failing to deliver prospectuses and another for questionable sales. Among recent enforcement actions, the SEC charged five executives and financial professionals involved in a fraudulent bond offering by an international law firm and froze the funds of an international pyramid scheme being promoted through social media. An international pyramid scheme being promoted on Facebook and Twitter, as well as on its own website, found its funds targeted by an emergency freeze obtained by the SEC. Fleet Mutual Wealth Limited and MWF Financial, collectively known as Mutual Wealth, were targeting investors via a website, Facebook and Twitter accounts and a team of “recruiters” by promising returns of 2%–3% per week to those who opened accounts with the fake company. Mutual Wealth, which passed itself off as a legitimate international investment firm, has been claiming to invest customer funds using an “innovative” high-frequency trading strategy that allows “capital to be invested into securities for no more than a few minutes.” This “speed investing” scam worked in classic pyramid scheme fashion, with Mutual Wealth encouraging existing investors to become “accredited advisors” and recruit new investors in exchange for a referral fee or commission. What investors don’t know is that Mutual Wealth is none of things it says, and does none of the things it claims to do with their money. Instead, the fake firm, which has no Hong Kong headquarters or New York data center as it claims, funnels the funds to offshore bank accounts held by shell companies. The company also lies about being “registered” or “duly registered” with the SEC and lists a group of fictitious executives on its site. The company has a twisted trail that leads from its U.S. efforts to entities in Panama and the U.K., through which it operates. It uses offshore bank accounts in Cyprus and Latvia and offshore “payment processors” to divert money from investors. Mutual Wealth’s sole director and shareholder presented forged and stolen passports and a bogus address to foreign government authorities and payment processors. Savvy in the ways of social networks, some of Mutual Wealth’s “accredited advisors” then use social media channels ranging from Facebook and Twitter to YouTube and Skype to recruit additional investors and earn referral fees and commissions. Mutual Wealth also regularly updates its status on its Facebook page, and often fills the comment sections under its posts with solicitations by the accredited advisors. It also tweets announcements posted on its Facebook page. About 150 U.S. investors were duped into “investing” at least $300,000 with the scammers, and the SEC obtained the emergency freeze to keep the scammers from running off with the funds that remain in the company’s accounts. The fake website was also ordered shut down. The SEC’s complaint also lists several relief defendants for the purpose of recovering investor money. These defendants are linked to the offshore accounts to which investor funds were sent: Risort Partners Inc., Hullstar Capital LLP, Camber Alliance LLP, Kimrod Estate LLP, and Midlcorp Trade LTD. The SEC requested, and received from the Honorable Dolly M. Gee, a court order deactivating Mutual Wealth’s website and freezing assets in all accounts at any bank, financial institution, brokerage firm, or third-party payment processor (including those commercially known as SolidTrust Pay, EgoPay and Perfect Money) maintained for the benefit of Mutual Wealth. The agency’s investigation is continuing. The SEC has charged five executives and financial professionals who were behind a $150 million fraudulent bond offering by Dewey & LeBoeuf, the international law firm where they worked. The firm was suffering from financial woes thanks to the recession and heavy merger costs, according to the SEC. The financial professionals at the firm, afraid the firm’s credit lines would be cut off by its bank lenders, first resorted to accounting fraud, combing through its financial statements line by line and devising ways to artificially inflate income and distort financial performance. Then the firm, which is no longer in business, used those phony numbers as a basis for a bond scheme to raise funds. According to the agency, senior financial officers inflated the firm’s profitability by approximately $36 million (15%) in its 2008 financial results through use of accounting tricks. 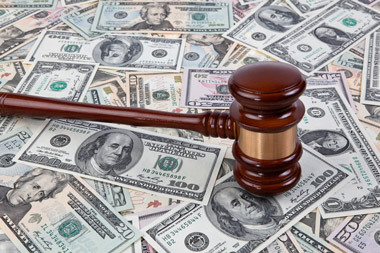 Those tricks included falsely reclassifying compensation for some personnel as an equity distribution in the amount of $13.8 million when those personnel had no equity in the firm; reversing millions of dollars of uncollectible disbursements; mischaracterizing millions of dollars of credit card debt owed by the firm as bogus disbursements owed by clients; and inaccurately accounting for significant lease obligations held by the firm. The firm’s former chairman, Steven Davis; executive director, Stephen DiCarmine; chief financial officer, Joel Sanders; finance director, Frank Canellas; and controller Tom Mullikin were all charged by the agency. In a parallel action, the Manhattan District Attorney’s Office has also announced criminal charges against Davis, DiCarmine and Sanders. The SEC seeks disgorgement and financial penalties as well as permanent injunctions against all five defendants, and officer and director bars against Davis, DiCarmine, and Sanders. The agency also will separately seek to prohibit Davis and DiCarmine from practicing as lawyers on behalf of any publicly traded company or other entity regulated by the SEC. Chicago-based Chase Investment Services Corp. was censured by FINRA and fined $825,000 for its failure to provide customers prospectuses for certain mutual fund and ETF transactions in 1,101,271 instances. The firm neither admitted nor denied FINRA’s findings. Chase had contracted with a third-party service provider to furnish prospectuses to customers, but was nevertheless responsible to ensure that the job was done. Chase launched a fee-based, discretionary, unified managed account through which clients could hold, among other investments, mutual funds, ETFs and money market funds. But because of a configuration error in the automated systems used for prospectus delivery, Chase told its service provider to deliver prospectuses for mutual fund and ETF transactions to the investment advisor, a firm affiliate, instead of directly to customers. As a result, unified managed account customers for whose accounts mutual funds and ETFs had been purchased were never provided with important disclosure information about the products. FINRA also found that Chase did not have a supervisory system that was equipped to keep the firm in compliance on prospectus delivery requirements. While Chase had access to the service provider’s system to review prospectus delivery reports, but it failed to review those reports, and also failed to give access to the provider’s system to the groups that monitored prospectus delivery compliance. BB&T Securities LLC of Richmond, Va., formerly known as Clearview Correspondent Services LLC, was censured by FINRA and fined $300,000 over findings that its affiliate and former member firm, Scott & Stringfellow LLC (S&S), with which it has since merged, effected sales of unregistered securities in contravention of Section 5 of the Securities Act of 1933. According to FINRA, the firm participated in the sale of approximately 242 million shares of unregistered stock of low-priced securities on behalf of issuers, which generated proceeds of approximately $537,000. The securities were not subject to a registration statement. FINRA found that even though there were some aspects of the sales that should have sparked investigation, such as substantial deposits of the same low-priced securities in related accounts at the firm followed shortly by liquidation of the shares, S&S didn’t bother to look into the matter to be sure that the sales didn’t violate Section 5. In addition, FINRA found that S&S did not have an anti-money laundering program (AML) that could have prevented the questionable trading activity. Although eventually the firm’s AML program in the end did find and stop the trades, it wasn’t till the activities had gone on for four months. Other failures FINRA found included BB&T and S&S not having consistently sent letters to customers notifying them of a change in address made to their account records, thanks to a problem with the firm’s automated systems, and insufficient records concerning its research analysts’ public appearances ensuring that they made required disclosures.